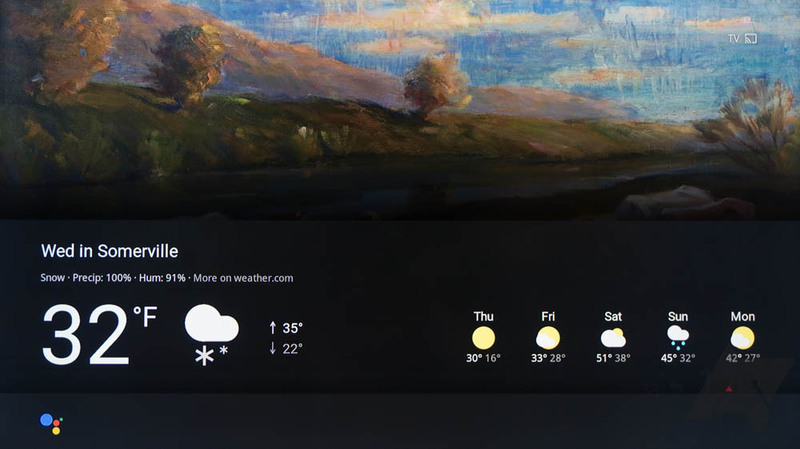 We've been able to ask Google Assistant for information about the local weather for a long time, and your Chromecast's home screen has shown the current temperature along with a weather icon. 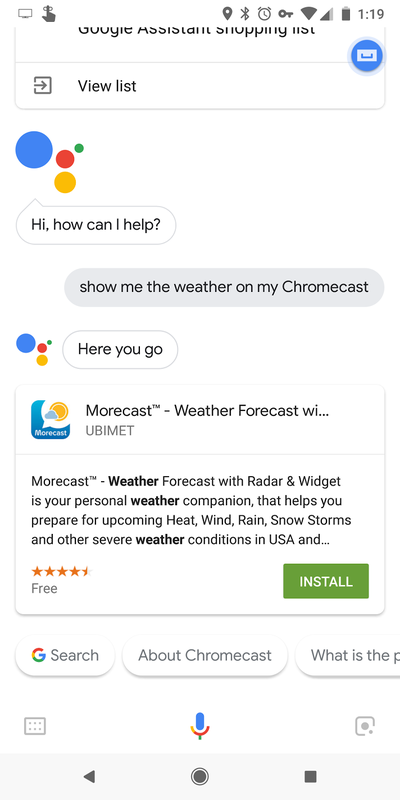 But if you wanted to check out your upcoming weather, the only option was to "OK Google" yourself a forecast while you sit and listen through it. Back at I/O, Google announced upcoming contextual visual responses for the Google Home/Assistant and Chromecast, and now at least one of the features they showed off is here. You can now ask your Google Home to show you the weather on your Chromecast. To trigger the new feature, all you need to do is ask your Google Home to show you the weather while your Chromecast is powered on. (For example "Ok Google, show me the weather on my TV," or even just "Hey Google, show me the weather.") After a bit of a delay, an overlay card like that above will appear on top of whatever content is currently on your Chromecast while your Google Home reads the weather, as it did before. So if you're in the middle of a day-long Altered Carbon binge, you can check and see that the world still follows the cycles of weather without interrupting your show. The overlay shows the current weather in more detail, with expected high and low temperatures, precipitation, humidity, and a further five-day forecast. Based on reports from Reddit, this feature isn't live in all countries just yet, so YMMV. It also doesn't work with the Google Assistant on phones. Like many other features, this appears to be exclusive to dedicated Assistant-powered hardware like the Google Home lineup. According to a help page recently spotted on Google's support site, this new feature is not compatible with the original 1st gen Chromecast or Android TVs. In the latter case, some of our readers have noted success when triggering it via the Assistant on the Android TV device itself, though. Additional weather commands are also available according to the document, including asking for a specific day, duration of days up to five, the weekend, particular units, or distinct locations. Google's support page is now live and it explains that you can say "show me the weather" or specify a different location and/or time. In order for this to work, it requires a Chromecast 2nd gen or Ultra running Cast firmware 1.28 and above and a Google Home. It won't work with Android TVs, TVs with built-in Chromecast, or Chromecast 1st gen.